Uploading files on is one of the most common things on the web. This file uploader aids content writers, web developers and everyone who uses or owns a website to write. Everything we do on the web requires file uploads either images, texts or videos. This is the more reason, web developers install file upload scripts for on almost every site, to help site visitors exchange files with ease. Developers have also designed various plugins that can add beauty and speed to how file uploads happen on your site. Today, drag and drop plugins have taken over the old click and upload method of adding files to a server. Web designers are moving with the trends, also making sure it improves website performance and speed as well. With a simple click and drag action, you can move files or objects within a page on your website. These plugins are available on the internet for free. While some with more features go for a premium price. We have taken the liberty to give you some of the best free drag and drop file uploader plugins. They all come with amazing features that will enhance your website. Some of these plugins are very easy to use and also, allows users to build unique features. The drag and drop file uploader plugin have access markup, compile events, and render fast DOM. One of its main features is the drag and drop functionality which is also very mobile friendly and works well on all devices. Our aim is to help you with your decision on which drag and drop file uploader plugin to pick for your next project. First on our list is the beautiful looking jQuery and PHP Fileuploader plugin which is built with a powerful HTML5 file upload tool. The plugin adds aesthetics to your page once implemented and makes file uploading a simple thing to do. This drag and drop file uploader comes with amazing features like drag and drop file upload, custom input and thumbnail elements, multiple file upload from different folders, file preview, file icon background generation, fancy animations, fully responsive and so many more. 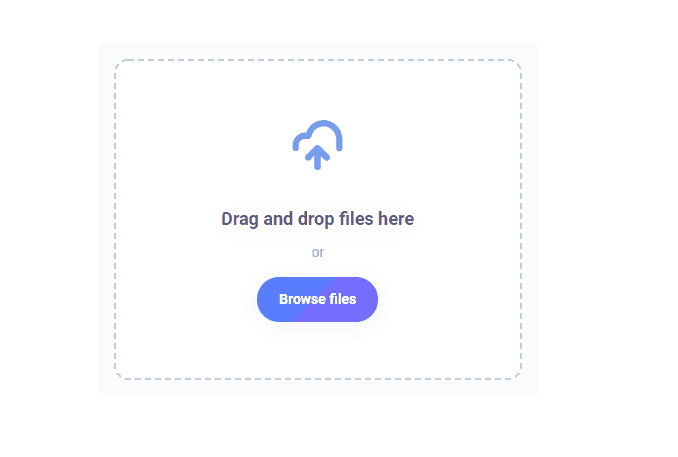 DropArea is another wonderful jQuery plugin, that makes it very easy for website owners or site visitors to upload files on the net, using the drag and drop action. This plugin is plain, easy to use, self-explanatory, and its main feature is the drag and drop file uploader. You can also upload a file using the select file method as well. Use the link below to see the demo. This jQuery file uploader is the only one on our list so far with 5 versions (Basi, Basic-Plus, Basic-Plus UI, jQuery UI, and Angular JS). The basic version does not provide a user interface plugin like the UI version. Although all the versions have their differences, they also have some unique features like drag & drop, multiple file upload, upload progress bar, image resize before upload, and many more depending on the version you choose. This plugin supports multiple browsers. This is a lightweight plugin that is designed with a powerful drag and drop file uploader. 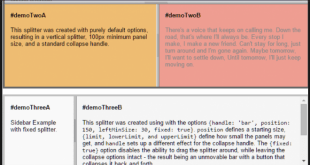 Dropzone lets you customize your drag & drop interface to look the way you want. You can also resize images upon upload with preview. The downside is, you might want to update your browsers or the drag & drop feature won’t work. Check it out using the link below. This is one simple plugin that is clean and adds beauty to any website. It is built with HTML 5 and has a good user interface. jQuery.filer plugin can be designed using its default templates to suit the way you want your UI to look. Some of its features include multiple file upload from different folders, drag & drop, large file upload in smaller chunks, image resizing, custom validation code for file size control, and files preloaded can be sorted and updated. 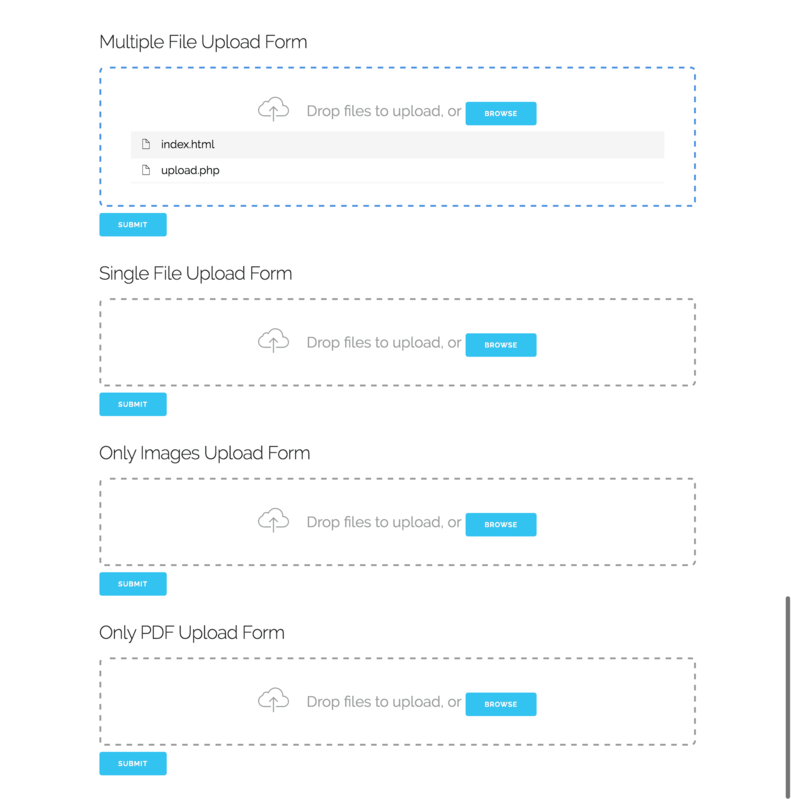 Plupload is a drag and drop file uploader plugin that is easy to customize. It has a visually flat design which makes it special and cool. This plugin uses HTML 5 API and has a built-in user interface, large files can be uploaded in chunks or pieces and one of its special features is the ability to shrink images into thumbnails just before uploading on the client-side to save bandwidth. Plupload also supports more than 30 different languages with file filters to fit file upload requirements. 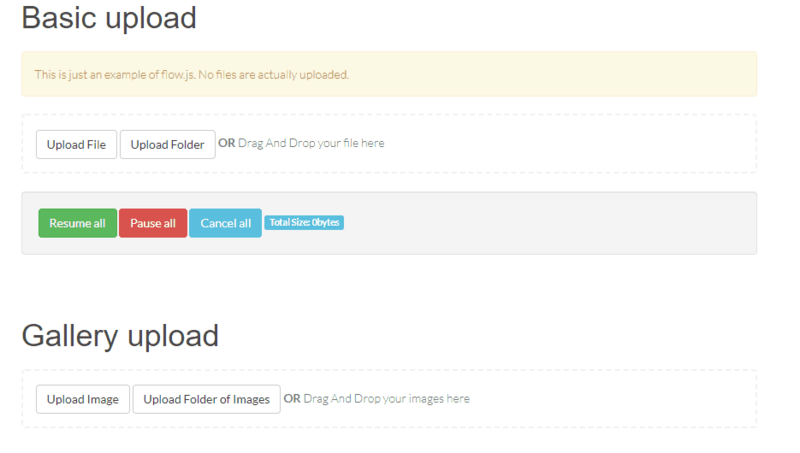 pekeUpload drag and drop file uploader is a jQuery plugin that allows single and multiple file uploads on a website. It also uses HTML 5 and is easy to customize for instance, you can set file size restriction for file uploads. The main feature is the drag and drop action others include file preview, custom error messages and many more. Check out the demo using the link below. The developers of this API have put together everything users would need to create a good and effective drag and drop file uploader. This API can be used for file uploads and management. Check it out using the link below. If you are looking for a lightweight drag and drop file uploader plugin, then jQuery HTML5 Uploader is exactly what you are looking for. This plugin allows file upload from Gmail or Dropbox by creating a div element while jQuery HTML5 uploader takes action. Its features include drag & drop, single/multiple file uploads, and many more. For those who like custom plugins, this is the right HTML5 drag and drop file uploader for you. It has some PHP and file reader API, which can be customized to let users know which files they have uploaded previously. It is a clean flat and simple plugin to install on any website. Check it out below. KCFinder is an open-source web file upload manager which can be integrated into web editors or custom web apps. It can upload flash videos, images, URLs and every other file that can be added into any web editor’s HTML content. This tool has a simple user interface and is self-explanatory. Other features include clipboard to copy, move and download multiple files, Ctrl/Command key multi-file selection, and many more. This is by far the simplest of all the plugins here on our list today. It is flat, plain and direct. It is not as sophisticated as the other drag and drop file uploaders, meaning it has only a few features like drag & drop, select file option, upload progress bar, queued uploads, chunk uploads and more. Click the link below to see a demo and also to get this uploader. 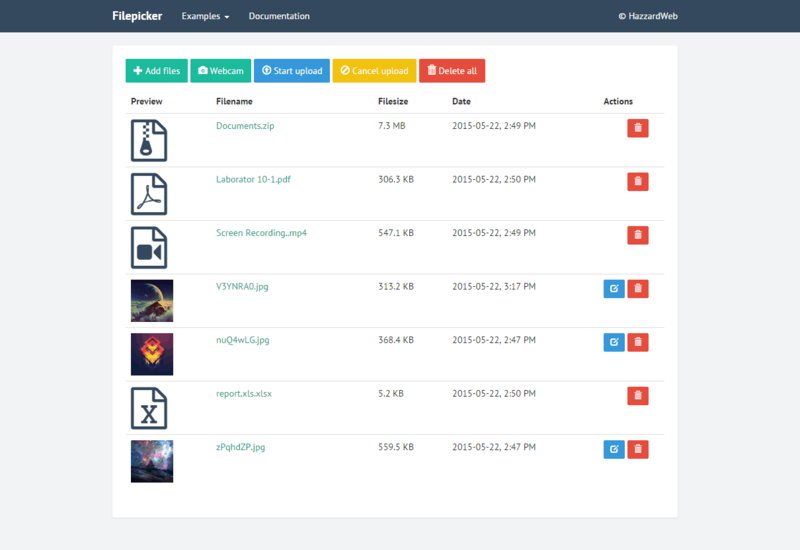 elFinder is a jQuery open-source file manager built with JavaScipt. It uses the jQuery user interface and the developer drew inspiration from the convenience and simplicity of the Mac OS X operating system’s Finder program. Features include responsive and mobile friendly on touch devices, perform all operations like copy, move, upload, create folder/file, rename, etc. with files and folders on a remote server. It supports background file upload and Drag & Drop HTML5, and more. File upload progress bar is built using jQuery and PHP. It is a simple file uploader the is developed with PHP APC library, this jQuery uploader is simply for the file upload process to your server in seconds. Its progress bar color can be changed or customized using the jQuery CSS property in the element. Check out the demo below. Upload center is a web application that allows users to upload images by a simple drag and drop action. It has a photo preview feature, progress bar, and more. File uploads only work on Chrome and Firefox browsers for now and this web application can be integrated with jQuery file upload plugins like Filedrop for more functionality. Check it out using the link below. Droplu-JS is a cross-platform jQuery drag and drop file uploader. It has a responsive layout and user interface which allows people to upload files in chunks, customize themes, set file type, and size filters, progress bar, CSS3 animations, file preview and many more. This flexible uploader is licensed by MIT and GPL so be rest assured it is highly efficient for file uploads. This is a multi-file picker as its name implies, it is an advanced script that people can use for multiple file uploads to their websites or servers. Filepicker is easy to customize with many advanced features like pagination plugins, cropping, advanced image editing and you can take pictures with a webcam. This is a premium uploader so it cost a small fee just $18 and $4.88 for extended support. This file uploader is compatible with all browsers and can work on the ones that do not support HTML5 and CSS3. Uploaderr 2.0 uses AJAX to upload with IFRAME fallback for unsupported browsers. It features the usual drag and drop, multiple file selection, animated status and progress bars, error message notifications, as well as server error notifications etc. This plugin is very responsive and perfect for those who like it simple. This drag and drop file uploader are not free, it costs a small fee of just $11 with support extension for about $3. The MVC jQuery file upload is a powerful widget, that lets people select multiple files for upload unto their websites or servers, regardless of the file type. This widget also supports the drag and drop feature, audio and video file upload, file size and type validation, image preview, progress bar and more. The widget is not free, so users have to pay a small fee of about $10 to get the full premium features. If you are looking for the best free file uploaders on the internet, our list of 30+ Drag and Drop File Uploaders will give you an overview of what you have been searching for. They will improve how you and your site visitors upload files. Most of the plugins on our list are free, but there are some that require a small fee and they all have premium features that make file upload stress free. These plugins and scripts will add beauty, user-friendly experience, and a sleek interface to your website. Choose from the above list, share your comments with us and follow us for more updates.